Childrens entertainer Silly Scott will be entertaining in Portchester. EVENT: Celebrating his 25th anniversary, Silly Scott presents a new family-friendly theatre show with amazing illusions and comedy magic. Tickets £8. Portchester Community Centre, Wednesday, 3.30pm. FILM: Lara dreams of becoming a ballerina. Assigned male at birth, Lara has to overcome more than blistered feet to realise her dream. No6 Cinema, Portsmouth Dockyard, Thursday, 7pm. GIG: Blues legends Larry Garner and Norman Beaker return to the stage with The Norman Beaker Band. Tickets £16, £15 concessions. The Spring Arts Centre, Havant, Thursday, 8pm. 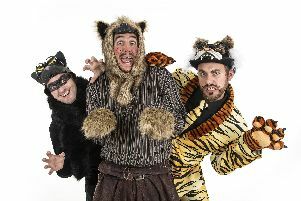 STAGE: Watch Rudyard Kipling’s famous novel The Jungle Book come alive on stage with Wicket Productions in this family-friendly show. Tickets £18, concessions £15.50. New Theatre Royal, Guildhall Walk, Wednesday, 6pm. FILM: In BlacKkKlansman (15) Ron Stallworth is the first African-American to serve in the Colorado Springs Police Department and he bravely infiltrates the Ku Klux Klan. No6 Cinema, Portsmouth Dockyard, Wednesday, 7.30pm. THEATRE: This Kings Theatre and Jack Edwards production bring together young performers to perform in Bugsy Malone. Tickets £19.50, children £13.50. Kings Theatre, Southsea, Wednesday, 1.30pm/6.30pm.